The WORCESTER PARK Blog :: Operator? 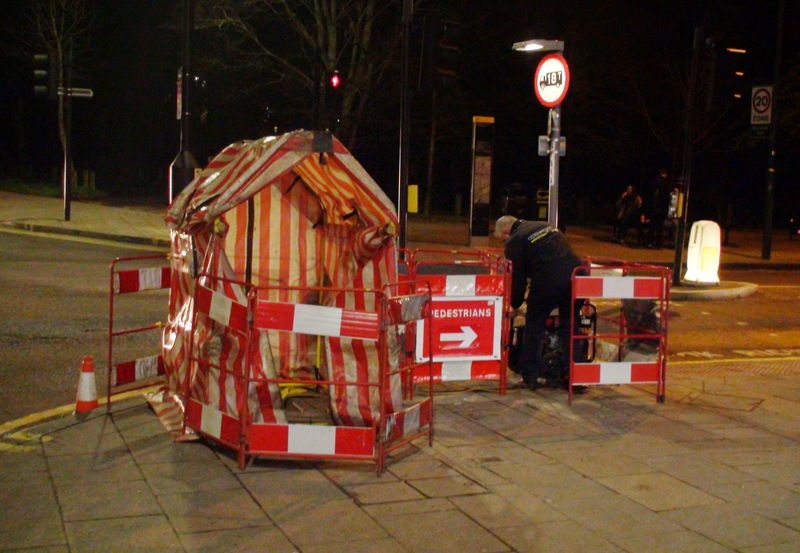 Anyway, readers may have noticed the cabling operation going on over the last couple of days at the bottom of Central Road culminating with this little camp out on the corner of Central Road and Green Lane. The gentleman is now in the process of changing over all the phone lines (around 1600 of them from one huge underground telephone cable - around 4-5 inches in diameter). The cable connects many home phones down in the areas mentioned with the telephone exchange just behind the old Post Office. If you live in that area you might lose your telephone for around 5 minutes sometime this evening or tonight. The chap said they would be there all night getting it done. Apparently the is a water leak down there somewhere too because the phone cables and some of the manhole covered access points are all full of water - all adding to the fun of doing his job. It seems it was the water, soaking into the old paper insulation of the really old phone cable that started causing the problems in the first place with the 50 volt signal sparking and eventually shorting out the thin wires. However I am assured the new cables they are putting in are designed to cope much better with these things.